Trade union membership has been declining since the 1980s. Recently, however, there has been renewed interest in the potential of collective bargaining to address rising wealth inequality and poor wage growth. This column presents an OECD report on collective bargaining institutions and practices across member countries and selected emerging economies. Despite substantial variation across member countries, the overall pattern is one of a broad decline in the use of collective bargaining to set the terms of employment. Since the 19th century, trade (or labour) unions and the collective negotiation of labour standards and terms of employment have been key features of the labour market in all OECD countries. But the perception that collective bargaining is in decline has become widespread in recent decades (Schnabel 2013). More recently, rising inequalities, poor wage growth, and an overall increased dissatisfaction with economic performance have led to a renewed interest in the state of social dialogue and collective bargaining as a tool to increase workers’ voices and strengthen their bargaining power. Other factors raising the current interest in collective bargaining systems are their potential to strengthen labour market resilience to macroeconomic shocks (OECD 2012, 2017a, IMF 2016) and to better manage the labour market challenges arising from the globalisation, technological change, and workforce ageing, especially as regards the consequences for workers. The latest edition of the OECD Employment Outlook (OECD 2017b) provides a rich overview of collective bargaining institutions and practices, as they function today in OECD countries and a selected group of emerging economies. On average across OECD countries, 30% of workers were members of a union in 1985. The corresponding figure today is only 17%. Union members tend to be predominantly male, middle-aged (between 25 and 54 years old), working with medium or high skills in medium or large firms, and on a permanent contract. These averages mask huge variations across countries – only 4.5% of workers are unionised in Estonia and about 6% in Turkey, while about 65% are union members in Sweden, Denmark, and Finland, and 92% in Iceland. 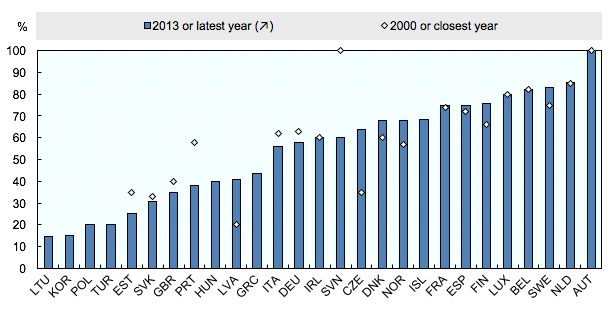 Figure 1 shows that declining unionisation is common to many OECD countries. 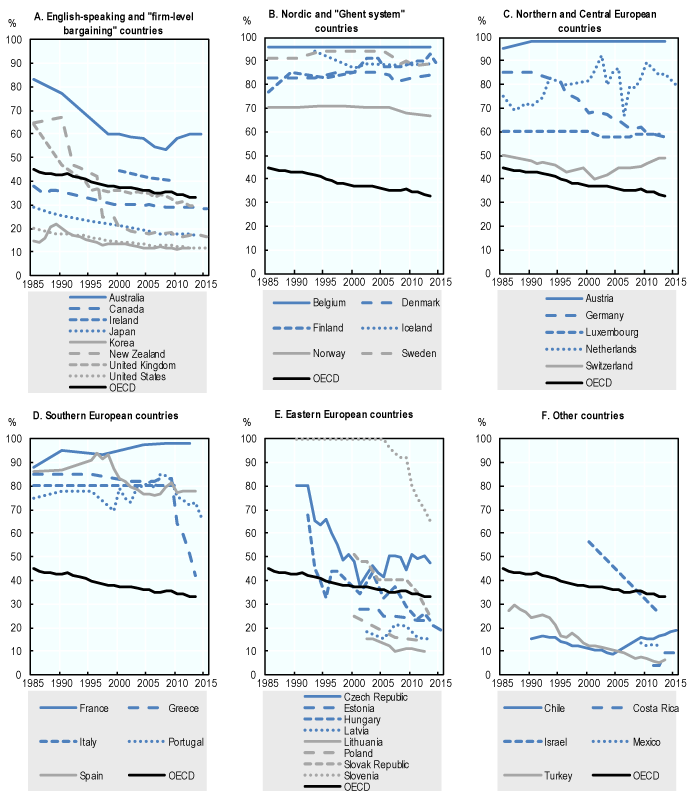 Only Iceland, Belgium, Spain, and, more recently, Italy have experienced a (very) small increase in trade union density since 1985 (however, part of the increase, at least in Italy and Spain, is due to a composition effect – the destruction of jobs in 2008-2010 occurred mainly in temporary employment, which had low representation of union members). In Central and Eastern European countries, the decline in union density has been quite dramatic, due to the collapse of the union affiliation rate after the fall of central planning (stabilised at 10% over recent years). Currently, the union membership rate is above 50% only in countries where unemployment benefits are administered by union-affiliated institutions (sometimes called the ‘Ghent system’, as found in Denmark, Finland, Iceland, Sweden and, partly, as the government also plays a significant role, Belgium) and in Norway. However, even the Ghent system has been increasingly challenged and eroded by the development of private insurance funds offering unemployment insurance without requiring union membership (Bockerman and Uusitalo 2006, Høgedahl and Kongshøj 2017) leading to a decrease in trade union density. Source: See detailed notes of Figure 4.2 in OECD Employment Outlook 2017. Employers are the other key actors of collective bargaining, but much less is known about their membership in employer and business organisations. Our new data show that membership to business and employer organisations has shown remarkable stability that contrasts with the decline in union density. However, the representativeness of these organisations is very difficult to assess – official and up-to-date statistics on the number of workers covered, as distinct from the number of affiliated firms, are very limited and partial, and often based only on self-reported data. Further difficulty in providing a precise assessment arises from the possibility that firms belong to several employer associations, resulting in double-counting. Using available information, Figure 2 shows the share of employees in the private sector working in firms affiliated to an employer organisation. On average, employer organisation density in the 26 OECD countries for which data is available is 51%. Employer organisations tend to represent, in terms of employees, more firms in manufacturing and construction than in services. In most OECD countries, they are also more representative of medium and large firms. Source: See detailed notes of Figure 4.4 in OECD Employment Outlook 2017. Like trade union density, employer organisation density varies considerably across OECD and accession countries – it is very low in Central and Eastern European countries, Korea, and Turkey, but about 80% in the Netherlands, Sweden, Belgium, and Luxembourg (and 100% in Austria, due to compulsory affiliation for all firms). In most OECD countries outside Europe, employer associations represent the interests of business (i.e., lobby and voice) but do not bargain collective agreements, with most, if not all bargaining taking place at the firm level. Membership to employer organisations (at least in those countries for which time series are available) shows a remarkable stability which sharply contrasts with the fall observed in trade union density. Brandl and Lehr (2016) argue that employer associations have been able to adapt their organisational structure as well as their activities to the changing needs of business (for instance by offering negotiation training, legal representation, industrial information, health and safety advice, wage surveys, and marketing). The only exceptions are found in Slovenia (since 2006 membership is voluntary) and Portugal, where employer organisations declined rapidly between 2000 and 2013. The share of employees covered by collective agreements (called ‘collective bargaining coverage’) also declined significantly over the past 25 years. This indicator is key for comparing the pervasiveness of collective bargaining across countries since it indicates the share of the workforce whose employment conditions are directly set by collective negotiation. On average across OECD countries, coverage shrank by a fourth, from 45% in 1985 to 33% in 2013 (Figure 3). 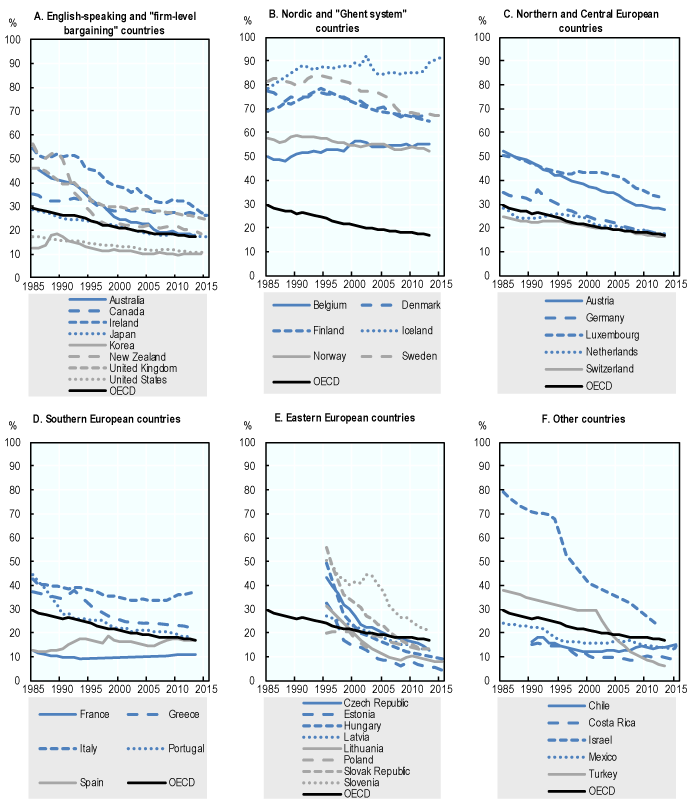 With the exception of some of the countries which passed major labour market reforms during the last five years, the recent economic crisis did not represent a particular turning point in coverage rates, which continued to decline in most countries at about the same rate that was observed during the pre-crisis period. Source: See detailed notes of Figure 4.5 in OECD Employment Outlook 2017. As with trade union density, the decline in coverage was strongest in Central and Eastern European countries where the transition to a market economy led to abrupt changes in the role of trade unions and collective bargaining. Steep decreases were also observed in Australia, New Zealand, and the UK, where deep reforms took place in the 1980s. Coverage has been relatively stable in most of continental European countries except for Germany and, more recently, Greece. On average across OECD and accession countries, collective bargaining coverage is slightly higher in manufacturing, construction, and energy and electricity supply than in business services or other sectors. Firm size also matters – 26% of workers are covered by a collective agreement in small firms while 34% are covered in large firms. In small firms, the probability of being covered by a collective agreement is much lower in the absence of a multi‑employer agreement at sectoral or national level as small firms are much less likely to negotiate and sign a firm-level agreement. All in all, collective bargaining coverage is high and stable only in countries where multi‑employer agreements (mainly sectoral or national) are negotiated. A closely related element influencing bargaining coverage is the relative strength of employer organisations and their willingness to negotiate (the correlation between collective bargaining coverage and employer density is 0.90) or the use of administrative extensions that extend the terms of agreements also to non-signatory firms. On the other hand the correlation between collective bargaining coverage and trade union density is weaker (0.64) as in most countries collective agreements also apply to non-union members thanks to the so-called erga omnes clauses. Looking ahead, the biggest challenge for collective bargaining is to remain relevant in a rapidly changing world of work. The membership and bargaining coverage rates presented above are obviously not the only elements needed to gauge the continuing influence and legitimacy of unions and employer organisations. In particular, it is also important to interpret these rates in light of each country’s unique national labour relations system and its historical development. Despite their limitations, these summary rates are useful proxy measures of the ability of unions and employers to represent the interests of a broad base of workers and firms, rather than only a narrow segment of them. The picture that emerges from the data discussed above is complex, but confirms the broad decline in the use of collective bargaining to set the terms of employment. This trend is particularly disquieting in light of the technological and organisational changes that are transforming the labour market and, together with significant labour market reforms, encouraging the growth of new forms of employment which blur traditional categories, such as ‘employer’, ‘employee’ and ‘place of work’. These changes represent a major challenge for collective bargaining systems given that they are still largely based on the concept of a standard work relationship. Some innovative responses are beginning to emerge, but we don’t know yet how well they will work. Editors' note: The opinions and arguments expressed here are those of the authors and do not necessarily reflect the views of the OECD nor of its member countries. Böckerman, P and P Uusitalo (2006), “Erosion of the Ghent System and union membership decline: Lessons from Finland”, British Journal of Industrial Relations, 44(2): 283-303. Brandl, B and A Lehr (2016), “The strange non-death of employer and business associations: An analysis of their representativeness and activities in Western European countries”, Economic and Industrial Democracy, 1–22. Høgedahl, L and K Kongshøj (2017), “New trajectories of unionization in the nordic Ghent countries: Changing labour market and welfare institutions”, European Journal of Industrial Relations, forthcoming. IMF (2016), “Time for a supply-side boost? Macroeconomic effects of labor and product market reforms in advanced economies”, Chapter 3 of World Economic Outlook, April. OECD (2012), “What nakes labour markets resilient during recessions?”, Chapter 2 of the OECD Employment Outlook 2012, OECD Publishing, Paris. OECD (2017a), “Labour market resilience: The role of structural and macroeconomic policies”, Chapter 2 of the OECD Employment Outlook 2017, OECD Publishing, Paris. OECD (2017b), “Collective bargaining in a changing world of work”, Chapter 4 of the OECD Employment Outlook 2017, OECD Publishing, Paris. Schnabel, C (2013), “Union membership and density: Some (not so) stylized facts and challenges”, European Journal of Industrial Relations, 19: 255-272.